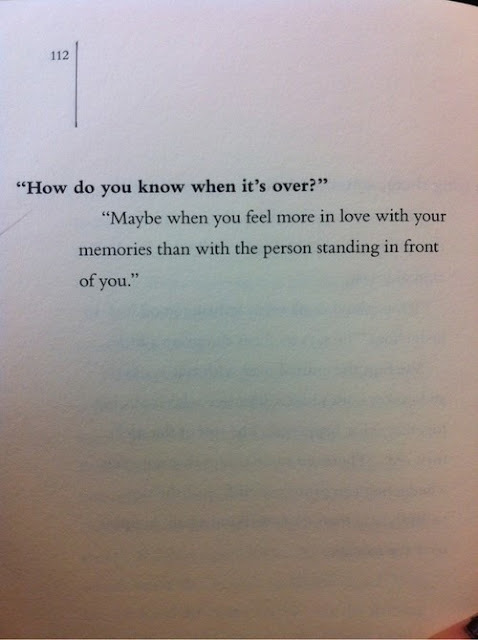 “How do you know when it's over?" I cam across the above quote and thought it was beautiful. It led me think how would you really know it is over? If you are constantly thinking about how good used to be, maybe it time to rethink about your relationship. If you are always thinking about someone else even when you are with them, then that is a sign too. If you are fighting over and over, about the same things with no end in sight, maybe that is an indication too. If you feel no spark or joy at the thought of being with them, chances are it is over. And finally if the thought of life without them in it, seems as a welcoe relief--then it is definitely over. But don't make a final conclusion yet. Move away. Give it space. And time. Sometimes that is all a relationship needs. And sometimes, that brings closure. If you like my thoughts, you will like my books. check out 'The One You Cannot Have' for a weekend read. This sounds interesting..and yet sounds true.. time to think about it. Nice thought provoking lines, absolutely true. Thanks for sharing this ! Beautiful thought. Still, easier said than done !!! You're exactly right! I always feel that Relationships are like the waves in the ocean. Some days there are high tides and some there are low. We need to adjust to the tides in order to understand our partner better. Initially, we get butterflies in our stomach, everything around us seems bright and beautiful, even if it's raining, and we don't seem to feel hungry or sleepy anytime, because we are in love. When the relationship is not making us feel like the above, we start questioning our self and our partner and ask whether it's really over. It is not easy to move on, but if we have a slightest doubt that the relationship can work, then we should try to give it a second chance, perhaps by taking a break in the relationship, give space to each other and try to start over. Again, if things are moving negatively, it is better to say good-bye and move on.